Does the BigSky have all the features of the blueSky and the Flint's reverb section? 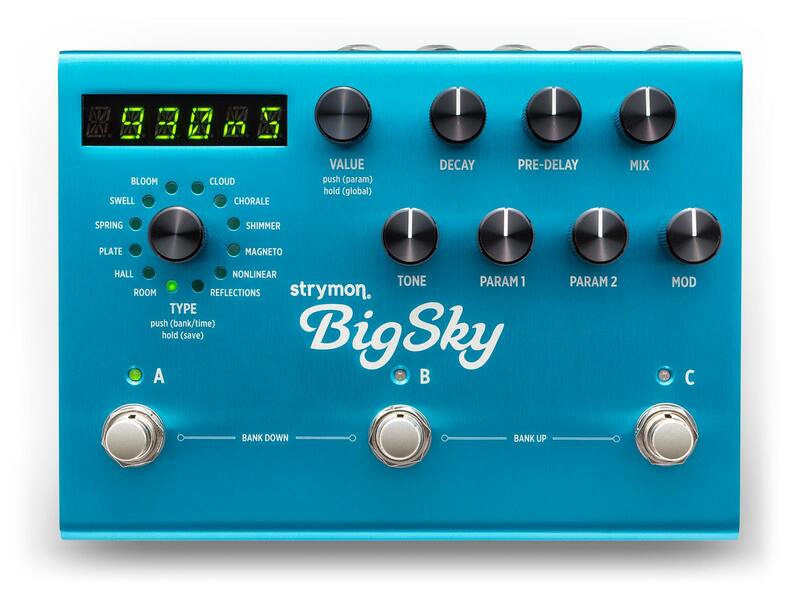 The BigSky reverb pedal has the three reverb types that are available on the blueSky pedal, however, though they both sound great, they have slight sonic differences. One difference is that you can use the Shimmer effect on each of the different reverb types available on that pedal (Plate, Room, and Spring). Also on the blueSky, the Plate reverb with Shimmer has an octave up, and the Spring and Room types have an octave plus a fifth up. On the BigSky, try setting the MODE parameter in the PARAMS menu to REGEN and using either just +Octave or +Octave & 5th settings. The era based reverbs on the Flint, however, are unique to that pedal and are not found on the BigSky. These reverbs can be set to sound darker than those found on the BigSky and blueSky pedal. How do I name and save presets on BigSky? Access the Globals Menu on the BigSky by holding down the Value encoder for about two seconds. Use theValue encoder to scroll through the Common Parameter Menu options and stop on “NAME”. Where can I find the BigSky factory preset list? A PDF of BigSky factory preset settings can be found here. Why am I getting noise in my audio? How do I check the Firmware on the BigSky? Power up BigSky while holding down the ‘C‘ footswitch. Turn the TYPE encoder until REVISN is displayed. Push the TYPE encoder, and the firmware version will be displayed. If you are having problems updating your BigSky, these tips should help you get going. The most recent BigSky firmware version can be downloaded here. When connecting two devices via MIDI you typically want to connect the MIDI OUT from one device to the MIDI IN on the other. Some MIDI interfaces label their cables in the opposite manner with “TO MIDI IN” and TO MIDI OUT”. So in this case connect the “TO MIDI IN” to the MIDI IN of your BigSky and the “TO MIDI OUT” to the MIDI OUT of your BigSky. Many times firmware updates via MIDI won’t play nice with devices that are not dedicated MIDI devices. We recommend performing your MIDI updates using a dedicated MIDI to USB interface.The Roland UM-ONE, Yamaha UX-16, and iConnectivity Mio devices are just some that work very well. You may run into problems trying to update through your MIDI jacks on something like an audio interface or keyboard. This is one of the most popular causes of a MIDI update failure. Try not to use class compliant (plug and play) drivers. These types of device drivers are typically not robust enough to handle even a small firmware update via MIDI. Whenever possible, download the latest and greatest device drivers directly from your MIDI interface’s manufacturer website. It’s always good to run the latest version of whatever software host you are using for your firmware update. Check the software manufacturer’s websites for new versions frequently to stay up to date. We always work hard to improve the experience our customers have with our products. The release notes below list the new features we’ve added to BigSky and issues we’ve resolved. Resolved issue when pedal is receiving MIDI Clock where only 23 pulses were counted the first time through its first cycle. Added MIDICL global parameter to allow for turning off response to MIDI clock. Firmware revision 1.19 is an archived release and is no longer available for download. All features and fixes in this revision have been ported over to our current release version 1.23. Firmware revision 1.15 is an archived release and is no longer available for download. Yes, it is possible to update BigSky via MIDI sysex. What are the power requirements for BigSky? BigSky requires a power supply that provides 9VDC (center negative) at a minimum of 300mA. Is BigSky a replacement for blueSky? No, we will continue to build both BigSky and blueSky side by side.